Glass is a hard material that can be made in many shapes. It is usually transparent, but it can also be made in colours. Glass is mainly made of silica; glass made of silica only is called silica glass. Glass used to make windows and bottles is a specific type called soda-lime glass, composed of about 75% silicon dioxide (SiO2), sodium oxide (Na2O) from sodium carbonate (Na2CO3), calcium oxide, also called lime (CaO), and several minor additives. By changing the proportions, and adding different ingredients, many kinds of glass can be made. 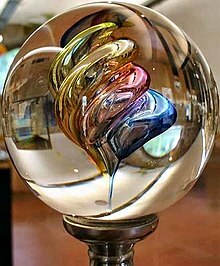 Coloured glass is made by adding small amounts of metal oxides. For example, a blue colour is given by tiny amounts of cobalt oxide.
" 'Cut glass' is glass that has been decorated entirely by hand by use of rotating wheels. Cuts are made in an otherwise completely smooth surface of the glass by workers holding and moving the piece against various sized metal or stone wheels". Because glass is used to make lenses, the word "glasses" means eyeglasses. The myth that glass is actually a liquid comes from the fact that old windows in houses and churches (200–300 years old) are sometimes a little out of shape: thicker at the bottom than the top. This is actually due to the process of glass making in the past which led to the glass pane being thicker at one edge than the other. It was sensible to install the windows with the thick edge at the bottom. Sometimes a window can be found with the thick edge at the top of the window. Glass can be recycled over and over. Glass bottles and jars can easily be recycled to make new glass bottles and jars or used in industry as aggregate (building material) or sand. Roman glass beaker from the 4th century A.D.
Stained glass windows in a Christian church. This page was last changed on 31 January 2019, at 02:58.